Nordic Roots storyteller and singer Kari Tauring and folk dancer Carol Sersland, along with Tapestry Folk Dance Center, bring the joy of this festival of light to the Tapestry Folkdance Center on Sunday, December 18 from 6 to 8 pm to celebrate the Winter Solstice which marks the time when the days slowly begin to lengthen and the light returns to the world. Celebrated as “Jul” (yule) in Scandinavian countries. The winter solstice marks the time when the days slowly begin to lengthen and the light returns to the world. Celebrated as “Jul” (yule) in Scandinavian countries, Nordic Roots storyteller and singer Kari Tauring and folk dancer Carol Sersland, along with Tapestry Folk Dance Center, bring the joy of this festival of light to the Tapestry Folkdance Center on Sunday, December 18 from 6 to 8 pm. “This Jultid Celebration will be an interactive performance, suitable for all ages and all activity levels,” says Kari Tauring. Kari received a 2011 Minnesota State Arts Board Folk and Traditional Arts Grant to develop a series of workshops and two celebrations. The Jultid Celebration is the first and in March, there will be the Ostara, a holiday that merges into our contemporary Easter celebration. The Jultid celebration is open to everyone. While some of the participants will have attended the story hours and dance workshops that Carol and Kari have been leading throughout the fall, “There are enough people who will know the dances that everyone else can just join in!” says Kari. The dances will be at different levels, so experienced folk dancers will be challenged and complete beginners will find dances tailored to them. Of course, the Jultide will include traditional, seasonal food. Attendees will receive a Jul gift of a rune on a string as they enter the dance space. Runes are the traditional Norse alphabet and each rune has a special meaning beyond its use as a letter. Kari, Carol, and Stavers in the House (musicians who create rhythms with stavs, or staffs) will present an Opening Toast and special program to welcome all to the Jultide. And then, the dancing begins! 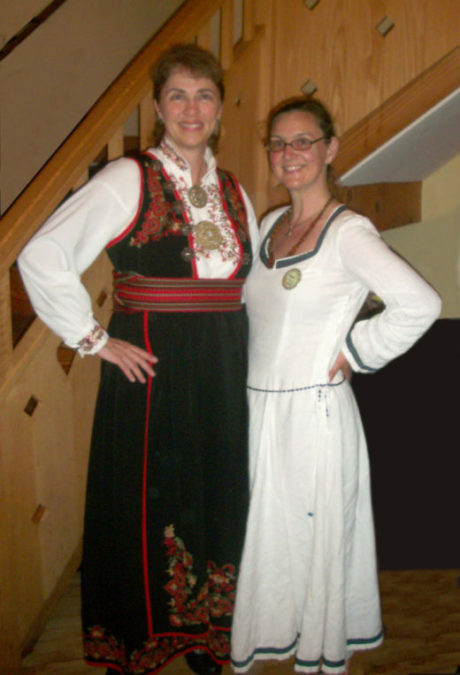 If you would like to join Carol and Kari for a workshop before the Jultid, please come to the Tapestry Folkdance Center on December 4 from 1 to 3:30. $10 for adults; $15 for families up to 5 people. The Jultid Celebration is December 18 from 6 to 8. $10 for adults, $15 for families, up to five people. Next Topic: Potter’s Field Tales no less rich and fascinating! Generosity doesn’t tell it all!